Geely shook up the world automotive order when it bought Volvo. Since then, it’s added Lotus, Proton, Terrafugia, the London Electric Vehicle Company (which makes London cabs) and nearly 10 per cent of Daimler to its collection, but it’s also created its own sub-premium global brand, Lynk & Co. The 02 is its second car, to be built in both northern China and Belgium, and its innovative subscription plan could shake up the automotive world all over again. This might be a while coming, and they’re not even open about where it will come from, but the Lynk & Co 02 could be the compact crossover that utterly disrupts the car industry. Firstly, it’s not bad. It’s actually pretty darn good, and it has every right to be. Parent company Geely is keen for the Lynk & Co brand to be known as anything but Chinese. It even went so far as to suggest it was more like a European or even a global brand. It might have a point. The start-up might be owned by Geely, but all of its design and engineering work has been done in Europe. 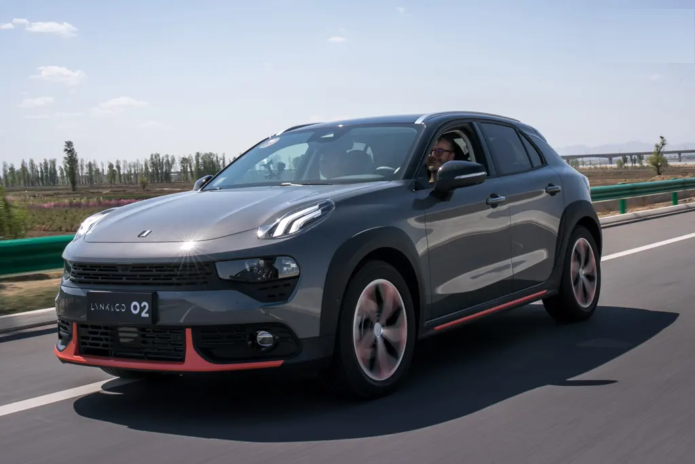 While its Chinese 02 and 03 models will be built at a shiny new factory north of Beijing, the western world’s Lynk & Co models will come from a factory in Belgium. China already has the larger 01 SUV (also bound for the western world), but the 03 sedan will remain a China-only car. It shares the same Compact Modular Architecture (CMA) as the excellent Volvo XC40 and the same Gothenburg-based people did its engineering and design, and they even created a new typeface for it. It will arrive as a semi-premium brand to sit beneath Volvo, leaving space for the eventual arrival of Geely-branded machines as the budget cars. But the real reason it threatens to disrupt the world is that it will introduce full subscription ‘ownership’ models. The cars will never be sold. Volvo has tried subscription in Europe already, but has been left high and dry by high perceived monthly rates of around €750 a month for an XC40. Lynk & Co plans to have three levels of monthly subscription fee: a new car price, a second-hand car subscription rate after the cars reach a certain mileage and then a third-hand rate, after which the cars are scrapped and recycled. There will be no warranty because it won’t be relevant, with all servicing, insurance and all running costs bar fuel fixed into the subscription price. It won’t just be Europe, either, because it’s already doing it in China (which may or may not be its home market) and that will be its only schtick, everywhere around the world. The things still have to be worth driving, even if you can subscribe to drive one for just a month here or a month there, and the 02 sure is. Our drive was brief: only around 20km near its new factory, three hours north of Beijing, but it was enough to notice a few things. Firstly, western-bound 02s will only use electrified powertrains (either hybrid, plug-in hybrid or full electric), and none of the cars we tested had one (because that tech will be a late arrival in China). The hybrid powertrain will be identical to the XC40’s, complete with its odd ‘seven-speed’ gearbox arrangement (four for the 1.5-litre petrol, three for the electric motor) and 50km of pure-electric range. So the best we could do was to drive both the 2.0-litre petrol four and then trial the 1.5-litre inline three that will sit alongside the electric motor, though these were fitted with Geely-designed seven-speed dual-clutch transmissions (which they engineer for a service life of 350,000km). First up, there are no pressing reasons not to like it and no obvious reasons not to ‘own’ it. It’s plenty good. There are still charming quirks, like an automatic transmission lever that goes R-N-P-N-D, but it’s mostly just impressive inside. The materials are surprisingly high-quality, there is subtlety in the design that you don’t find in plenty of Japanese rivals, and it’s an attractive place to be. Its 10.2-inch infotainment screen uses the same glass as the iPhone 8 (though our exploration of its usability was a bit hampered by the Chinese language programming). There is cleverness, too, because (unlike western car-makers) it makes its safety-focused, forward-facing camera (ahead of the rear-vision mirror) do double duty as a built-in, high-definition dashcam. It also records sound and can be used to capture the scenery anytime the driver wants it to. The 02 also promises free wifi, wireless phone charging, a pair of USB connections and a fully digital dash, with switchable views. The rear seats are a touch flat, but there’s enough space for adults on short trips or sub-teens for anything else. The front seats felt supportive and comfortable, too, with a wide range of adjustments. The modern car industry is a global beast, and the 02 takes is six airbags from TRW, some of its steel from ThyssenKrupp, its brake control systems from Bosch, its 17 driver assistance systems from Volvo and its all-wheel drive from BorgWarner. Beneath the CMA underpinnings is a MacPherson strut front-end and a four-link independent rear-end, high- and very high-strength steels everywhere and some aluminium where it’s needed. The 2.0-litre turbocharged four pumps out 140kW of power and 300Nm of torque, with Lynk & Co claiming it will reach 100km/h in 7.8 seconds (which felt about right to us). There are two versions of the 1.5-litre motor, starting with a 115kW/245Nm entry unit and topping out at a 135kW/265Nm engine. We drove the ‘big’ 1.5 and the 2.0-litre, and they’re both smooth engines. The four is cleaner, everywhere, all the time and is flexible in the mid range, and the 1.5 actually sounds nicer, even if it’s a bit gruffer down low in the revs. They’re both pleasant, unobtrusive companions (at least on our short drive) and neither of them will be leapt upon enthusiastically by the tuning world. They’re exactly what they suggest they are: competent, calm companions. The seven-speed is mostly clean and smooth, though it could be convinced to give some clunky shifts in its sport mode. The roads around the factory were all new (this area, north of the Great Wall, was intentionally neglected by the Chinese government for decades, expecting it to be invaded by the Russians) and super smooth. Still, the suspension tune found some nibbly bumps where we didn’t expect from the supposedly smoother Chinese tune (there are plans for a more handling-oriented tune for the west). The cars were all quiet at speed, too, with the cabins well isolated from road and wind noise, and the steering and pedals are light to use but have some feedback from the mechanical bits. The car is not here yet, obviously, but it’s a very promising start. For a city crossover, its ride is a touch firm over sharp-edged bumps, but everything else fits the bill perfectly and it’s far more interesting inside than anything from Japan or Korea (and most things from Europe). How much is a 2018 Lynk & Co 02?